As has become tradition, we kicked off the Walk for Life with our own meet-up before the rally before the Walk itself. The past several years we’ve partnered with Rehumanize International, Pro-Life San Francisco, and other non-traditional pro-life organizations to host a meet-up in front of the Asian Art Museum typically highlighting the diversity in the pro-life movement, the different ways we’ve each come into antiabortion advocacy, and the many reasons we’re pro-life. This year was no different. The meet-up, largely organized by our beloved Terrisa Bukovinac (both SPL co-leader and President of PLSF), included many excellent speeches. SPL co-leader Monica Snyder gave a brief speech about the “comfortable pro-choice person,” that is the pro-choice person who is comfortable with his or her stance largely due to reassuring falsehoods (e.g. abortion is illegal after the first trimester, Roe v. Wade did no more than make legal abortion an option, biology doesn’t tell us when life begins, women only abort mere clumps of cells, the CMP videos were entirely faked, late-term abortions are only ever done for dire medical necessity, and the pro-life movement is just a bunch of old rich white conservative Christian men). She concluded that she doesn’t take as much issue with the pro-choice person who is aware of the truth regarding all these ideas and defends the pro-choice position in context of the facts, but she is very tired of pro-choice people who can’t seem to hold their position with eyes wide open. You can see the full video of the speech (including sources) here. 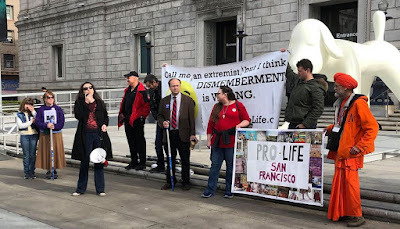 Other speakers discussed pro-life feminism, the consistent life ethic, the parallels between animal rights advocacy and pro-life advocacy, personal stories about the effects of abortion, and rousing calls to continue marching beyond the walk today and into our towns, school houses, and court houses. And while no doubt not everyone there agreed with every view of everyone else, we did all agree that we’re prepared to set aside differences and work together to fight abortion. Among the attendees and speakers were Christians, atheists, conservatives, liberals, straight, queer, Latino, white, women, men, young and old, and more. Berkeley Students for Life President Tamika Bassman spoke about how inspired she was by the diversity and harmony of last year’s Let There Be Life conference in Berkeley (sponsored by Pro-Life San Francisco); she explained that the conference really emphasized for her how people from all different walks for life can come together on this very important issue. This meet-up highlighted the same unity through our differences. It was wonderful to witness. 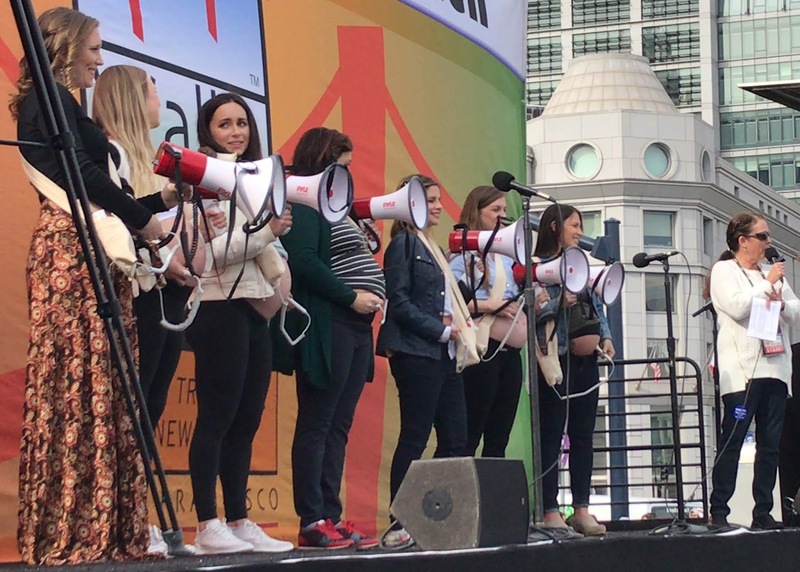 The rally before the Walk included speakers Abby Johnson and Patricia Sandoval, both former abortion clinic workers now in pro-life advocacy. 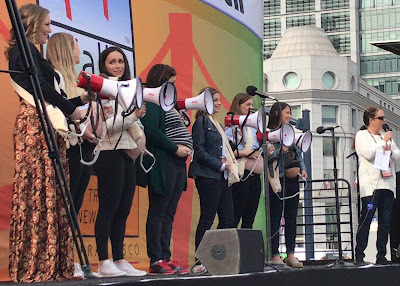 At one point both they and several other women, all of whom are pregnant, used megaphones to allow the crowd to hear their children’s heartbeats. After speeches, the mass of tens of thousands of marchers moved from the plaza onto Market Street, a major thoroughfare through downtown San Francisco. They walked past the downtown skyscrapers and past several dozen counter-protesters to the Justin Herman Plaza and the clock tower at Fisherman’s Wharf. This year marked the 15th Walk for Life, which started with only about 7,000 people in 2004. It’s now the second largest pro-life event after the D.C. March, and gives people who can’t haul all the way to East Coast an opportunity to mark the anniversary of Roe v. Wade.